(NaturalNews) Farmers may be able to harness the algal blooms caused by agricultural runoff into a viable product, thereby preventing dead zones in not just local waterways but across larger regions, according to a new study conducted by researchers from and presented at the 249th National Meeting & Exposition of the American Chemical Society in March. Algae harvested in this fashion could be turned into fertilizer or sold for biofuel production, the researcher said. "I grew up on a farm, and I know firsthand the needs of small-scale farmers, as well as the problems posed by algal blooms," researcher John B. Miller, PhD, said. "But I am also a chemist, so I see an upside with algae." The study was funded by Western Michigan University, the Department of Energy, the Smithsonian Institution and StatoilHydro. Algae are naturally occurring aquatic organisms that range in size from single cells to tiny clumps to massive seaweeds, and can grow with just water, light and nutrients. When fed with fertilizer runoff from farms (or waste from livestock operations), these normally benign or beneficial organisms can grow into out-of-control algal blooms that cover water sources, poison or choke out other life and consume all the oxygen in the water -- leaving behind a dead zone. In the new paper, the researchers sought to design a bioremediation system for preventing dead zones. This can only occur, they noted, by reducing the amount of nutrients flowing into large bodies of water. These are the bodies that tend to develop dead zones, because they collect nutrient runoff from a large area. Reducing this nutrient flow requires finding ways to remove nutrients from water runoff before it reaches large water sources. One way of doing this is to actively encourage algal growth in small surface waters, then remove the algal mats before they can grow large enough to do harm. As a byproduct of their growth, the algae will have removed excess nutrients from the water. 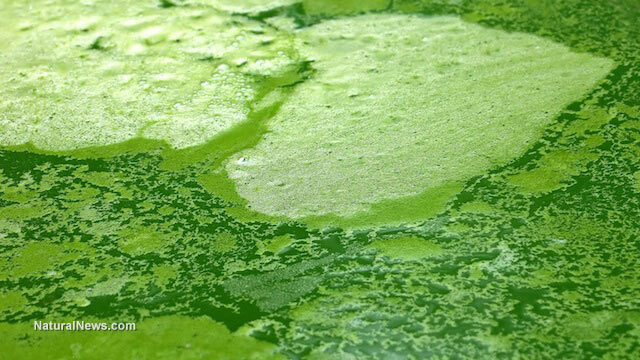 One benefit of this approach, the researchers wrote, is that algae can be fermented easily and directly into biofuels. The sale of algae for biofuel production would be a good profit source for farmers. In addition, the organic material left over from biofuel production could be used as a high-quality fertilizer (which would be an effective method of recycling the excess fertilizer that spilled off of agricultural fields in the first place). Both of these benefits would provide economic incentives to get farmers to take part in the bioremediation effort. Algae has already attracted the attention of biofuel producers, because it grows two to eight times faster than other biofuel feedstock crops, such as corn or soybeans. Large-scale algae production and harvesting operations have already started to spring up. In their paper, the researchers discuss the ways that such systems could be adapted for small farms in remote locations. "For small farm applications, the system must be easy to operate, nearly automatic and be suitable for diffuse installations," Miller said. "So, my focus has been to apply this technology without requiring the large infrastructure of the electric grid, large pumping installations and all the rest that is needed for centralized operations. A farmer won't have time to check an algae collection and processing system, so it has to also be able to operate remotely." The researchers are also investigating ways to encourage algae growth, such as using 3D printing to produce substrates with the geometric properties most favorable to algae. These substrates are currently being tested in the lab, along with techniques for algae collection that could work in remote regions.